An International Course on Conservation of Japanese Paper was conducted from August 25 to September 12. This course was co-organized by the National Research Institute for Cultural Properties, Tokyo and ICCROM. The main purpose of the course is to provide the person who work with cultural properties with the skills and knowledge necessary to conserve and restore paper cultural properties from Japan. Ten conservators from New Zealand, Taiwan, Denmark, the UK, Serbia, France, Cuba, the US, Australia, and Thailand were invited to attend this year’s course from among 69 applicants. Lectures covered topics such as basic science related to restoration materials and cultural properties from an academic perspective. In addition, participants practiced restoring Japanese paper to make a finished scroll and Japanese-style book binding. Folding screens and hanging scrolls are typical forms of Japanese cultural properties, and participants studied the construction of these objects and they practiced handling them. Participants visited the Mino region in Gifu Prefecture and they learned about the process of hand-making Japanese paper, ingredients of that paper, and the historical background behind its manufacture. In addition, participants visited a traditional restoration studio and shops selling traditional tools and materials in Kyoto. An active discussion took place on the final day of the course. Participants exchanged opinions on the use of Japanese paper in their respective countries, and some participants asked technical questions about conservation. 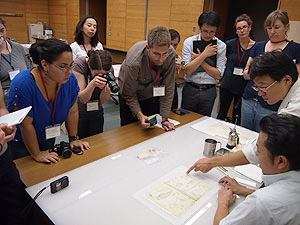 Through this course, Japanese techniques can help to conserve cultural properties overseas. Plans are to conduct similar courses in the future.